Discover the many highlights of Cuba on this exciting tour – Viva Cuba! Exuberant people, interesting cities and fascinating architecture… this exciting 15-night tour introduces you to Cuba’s cultural highlights. Subject to availability. Single supplements apply. This tour includes one night aboard aircraft. Please note: Cuba is a unique and highly rewarding destination, but you will find that the tourism infrastructure and local cuisine can sometimes be quite basic. This tour explores much of the island and so involves a few long journeys. After taking Saga’s included UK door-to-door travel service to the airport, fly to Havana. Stay three nights at the locally rated 5-star Melia Habana Hotel. Facilities here include a main restaurant, five alternative restaurants, a bar, outdoor swimming pool, fitness centre and spa (charges apply), gardens and terrace. Each of the 397 air-conditioned rooms have a television, telephone, safe and hairdryer. Contrast old and new Havana on an included tour and enjoy a Cuban cocktail lesson, and dinner at a local restaurant tonight. Optional evening excursion to the Tropicana Nightclub. Explore Havana independently or perhaps join a full-day optional excursion to Viñales Valley. Today you depart Havana for Cayo Santa María, stopping en route for a tour of Santa Clara, capital of Villa Clara province. Founded in 1689 with the main square and church at its centre, it is home to good examples of colonial architecture including the Teatro de la Caridad, a Cuban National Monument. In 1958, Santa Clara was the site of the last battle in the Cuban Revolution, when Che Guevara stopped a train carrying weapons and reinforcements to attack the revolutionaries. Since 1997 Che Guevara’s body has lain in a mausoleum in Santa Clara, which you’ll see on this sightseeing tour. After an included lunch in Santa Clara, you’ll continue to Cayo Santa María, a beautiful key or ‘cayo’, with a long sandy beach, on Cuba’s northern coast. You’ll spend the next two nights here on an all-inclusive basis at the locally rated 5-star Melia Cayo Santa Maria. Situated 10 metres from a white sandy beach the hotel has a choice of restaurants, a bar, pool, bar, beach bar and a snack bar. There are two swimming pools, a fitness centre and spa (charges apply). Each of the 360 air-conditioned rooms has a television, safe, minibar and hairdryer. At leisure. Perhaps explore Cayo Santa Maria or relax on one of its beautiful beaches. An included tour visits Trinidad and the famous La Canchanchara Bar. Stay overnight at the locally rated 2-star Villa Rancho Hatuey. The hotel comprises several accommodation blocks spread throughout the grounds and offers the chance to stay in an authentic, Cuban-style property, where amenities are functional, but may not be of the standard you will have experienced in other hotels. The hotel oozes character and along with the friendliness of the staff and locals you are sure to enjoy your stay here. Each of the 76 air-conditioned chalet-type rooms has views of the gardens and contains a satellite television, a telephone and radio. Included city tours of Sancti Spiritus and Camaguey. Stay overnight at the locally rated 2-star+ Hotel Colon, an older hotel with an eclectic charm but very small guest rooms. However, what this small hotel may lack in facilities, it makes up for with its warm and friendly welcome. Rooms have air conditioning and a television. Included tour of Bayamo. Stay three nights at the locally rated 5-star Melia Santiago de Cuba Hotel. The hotel has outdoor swimming pools and various sports facilities. Your included breakfasts and dinners are served in the hotel’s buffet-style ‘Las Columnas’ restaurant. For dinner, guests are requested to observe a smart dress code: gentlemen are not permitted to wear shorts or open-toed shoes. You can choose to dine in any of the hotel’s other restaurants at your own expense. Each of the 302 en suite guest rooms has a satellite television, telephone, radio, hairdryer, minibar and a safety deposit box. Included sightseeing tour and lunch at a local restaurant. You can spend today at leisure, taking advantage of the hotel facilities or exploring independently. Travel to Guardalavaca pausing en route for lunch. Stay three nights at the locally rated 4-star Sol Rio Luna y Mares. The resort is composed of two adjoining hotels with a beautiful sandy beach just 50 metres away. Facilities include a main buffet-style restaurant, plus a selection of other restaurants and bars, as well as a snack bar. There are three freshwater pools, including one in the wellness centre, a wellness centre (charges apply), sports courts, fitness centre, and live entertainment available. Each of the 444 air-conditioned rooms has a television, telephone, safe, mini bar, iron and ironing board and hairdryer. The next two days are free for you to relax on the beach or to enjoy the leisure facilities at your hotel. Enjoy the hotel facilities and white sand beaches. After lunch, travel to Camaguey and return to the Hotel Colon for an overnight stay. 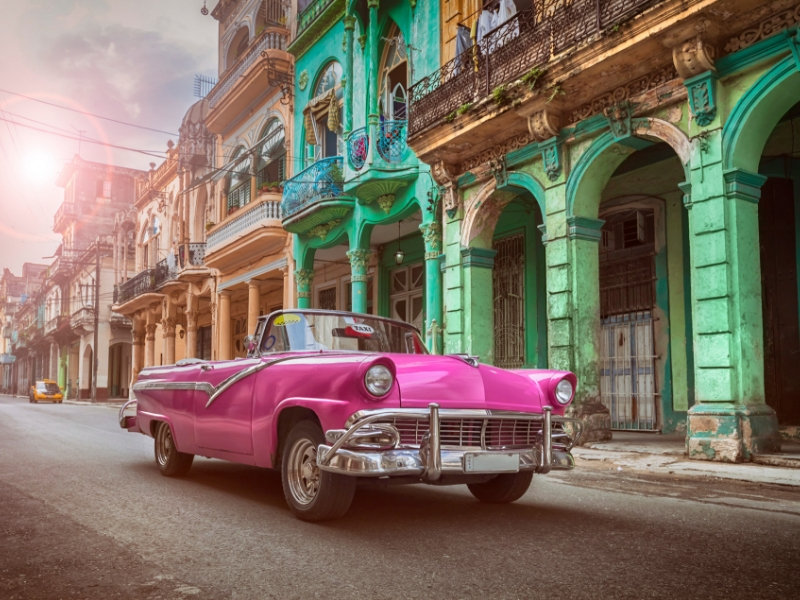 Travel back to Havana and stay overnight at the locally rated 5-star Melia Habana Hotel. An optional excursion traces Ernest Hemingway’s life in Cuba. Travel to the airport for your overnight flight back to the UK. Arrive in the morning for your included UK door-to-door travel service home. Organised by Connoisseur Travel ABTA P7377 on behalf of ATOL holder. Subject to availability. Prices are fluid, subject to availability. Based on 2 sharing and single supplements apply – unless stated. The price was correct at the time of publishing and while very effort is made to ensure these are as accurate as possible, they can fluctuate suddenly due to demand.